Wednesday was the first anniversary of Yordie’s Zen Garden at it’s location in Nishijima. This year, the garden was buried in snows so, Tak and I decided we’d have a Winter Celebration. We planned a party that was a little different than many parties. We wanted to have a geisha show to start the party, with me and a couple of girlfriends being willowy and floating as we danced, and I told a story. Then what would a party be without music and dancing, but toward the end of the party we wanted to do one more unusual thing… more on this below. 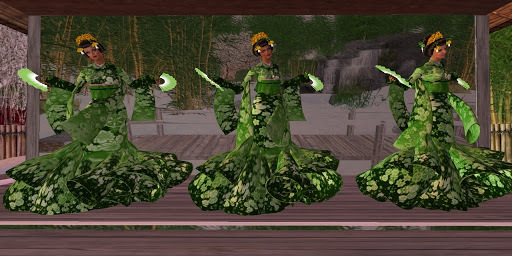 My friend Magi McBride has a long time interest in Zen, and has also created lovely Zen gardens in SL, so it was natural for me to ask her to be a dancer in the show. And of course, how could I possibly have a show of any kind without my longtime gal pal, Leanna. Fortunately, both agreed to be in the show and we spent a couple days getting our kimonos, fans and hairstyles just right. And we rehearsed diligently. Let me tell the rest of the story with photos my friends have provided. The music began, we danced and transitioned into my role as geisha, telling the story of “The Rabbit Who Crossed The Sea”, a tale I felt was particularly appropriate as it is The Year of the Rabbit in Chinese New Years. The show lasted about 20 minutes where normally a geisha show would be about an hour, but we just intended to give our friends a taste. I learned later that my onesan approved of my show, and even invited me to audition for some of her productions at Hosoi Ichiba. I was very honored. But now it was time for our party, with DJ Javier “The Candyman” Dulce. Javier is a featured DJ at the Ambrosia Club, which is where Tak rediscovered this old friend one night a few months ago. We had asked Javier to spin a set of some bluesy tunes mixed with some of the tunes he spins at Ambrosia. At the Harvest Moon Cafe, friends made their way into our tiny party pavilion, and Javier began spinning the blues. Many of our bluesy friends came but due to an apparent mix up that happened when I was sending out invitations, it looks like only 30 of 50 invites I had sent actually got to friends. I didn’t learn that this had happened until just before the party. Nonetheless, Minnie, Merrymay & Falls, Gracee & Dest, Dina & Kiff, Kia & Rip, Ellie, Bree, Tippy, Jada & Thunder, Javier’s wife Marley and Thor & Leanna stayed for the party. And altho I had mentioned in the invitation, there would be a martial arts exhibition, I don’t think guests were prepared when Tak & I left for a few minutes. When we returned, we had changed into our “exhibition” gear. Tak gave an introduction to the martial arts, then as Minnie Tunwarm began beating the Japanese drums, Tak & I went down to the ice to demonstrate some of the techniques he’d been teaching me. 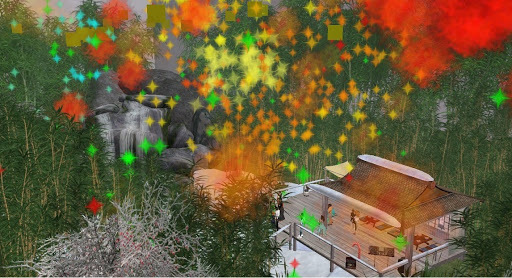 As our exhibition came to an end, Thor ignited an amazing fireworks display that lit up the night skies. Yes, this was an unusual party for a Wednesday night, but we had fun dreaming it up and enlisting friends to help us. Thanks to Magi, Leanna, Thor, Minnie and Javier for this wonderful celebration of a garden that has become more dear to Tak & I each year. Yay 1st Anniversary of Yordie’s Zen Garden! This entry was posted in Events and tagged Events, Friendships, Geisha & Samurai, Parties, Photography, Second Life, Zen Gardens. Bookmark the permalink. Thanks Yordie…..it was a special evening. You know I love the Zen garden and was honored you included me in the celebration.Hugs girlfriend. Thank you for all your help, Leanna. And thanks for your comment, Dahlia. 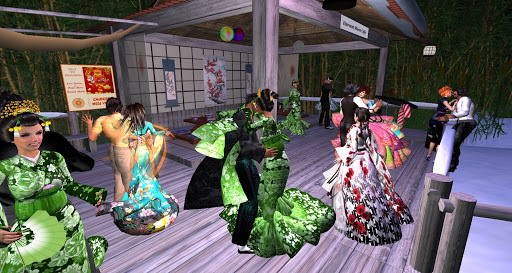 Yeah, it was a lot to coordinat and Leanna, Magi & me spent a lot of time working out some kinks in our geisha dance hud.The thing is tho, it was fun and having friends willing to help was a very enjoyable part of it.